Before you go anywhere you’ll need to complete the documentation at the car rental desk. Don’t forget to bring your passport, driving license, and the credit card you made the original booking with. And, although it’s not often asked for, a DVLA code so that the hire company can check if you have points on your licence. Depending on the country you’re going to you may also need an international driving permit. 2. What sort of car do you need? You may want a luxury car but do you need one? Generally speaking the smaller the car the cheaper it is, but as always it’s not that straightforward. Costs depend on the country you’re going to, the time of year, and demand. For instance, convertibles are at a premium in the summer, and MPV’s are less in demand during school term time. Every car is different. Chances are you’ll not be renting the same car model as you drive back home. Before heading out, take time to adjust the seat and mirrors to your liking. Check where controls such as air conditioning, lights, windshield wipers and handbrake are located. Once you’ve familiarised yourself with the vehicle you’re ready to go. 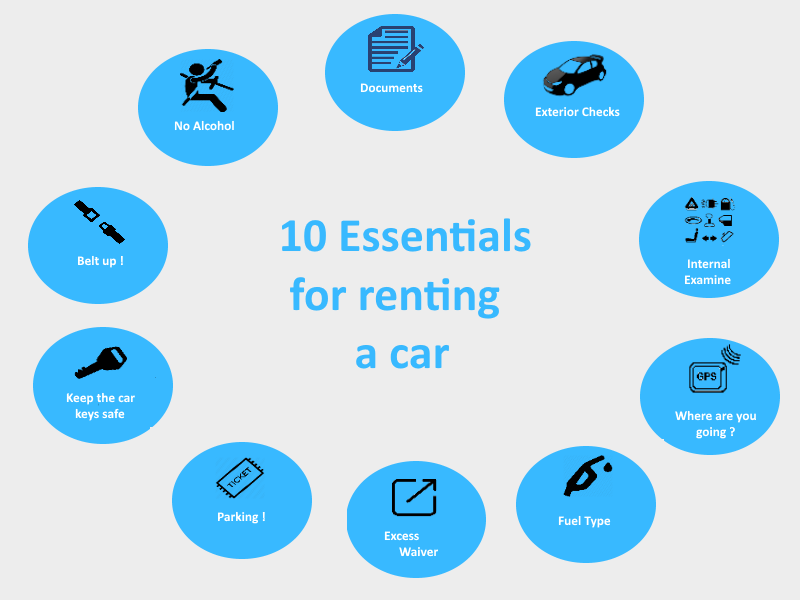 Before renting a car, it’s a good idea to have a travel plan with some idea of where you’re going and what you’re doing so you can use your time effectively. Don’t hesitate to ask our staff about where to go, eat or swim in your holiday location. As with everywhere, it’s the locals who know all the little secrets and gems to be discovered. Remember what fuel your hire car uses, especially if it’s not the same as your own car. Cleaning a fuel system out after filling up with the wrong type will take up your deposit and waste valuable holiday time. Also, most car rental companies offer a full to full fuel policy. This means the vehicle has a full fuel tank on pick-up and that you should return it full or pay fuel costs plus a penalty. Car hire insurance can be a complicated minefield. It goes without saying that you need it, but you’ll have to decide from the different types on offer by both the hire company and specialist third parties. Whatever you choose, look closely at the car on pick-up and take photos if possible. If there are any defects not already mentioned in writing, make sure a member of staff is aware and it is, again, put in writing. This can make the world of difference if there is a dispute later on. Make sure you know the rules of the road in the country you’re visiting. Some things are more obvious than others, such as which side of the road to drive on. Others aren’t; in Spain, those who wear glasses or contacts must keep a spare pair of glasses in the car. In Britain, London has a congestion charge for which there is a fee for driving in parts of London at certain times. In France, Paris, Lyon, Lille and Grenoble have low emission zones where you must display a certificate showing the class your vehicle is in based on its exhaust emissions. If you don’t have one there is a fine. Car keys are hi-tech bits of kit, so you can’t just nip to the ironmongers and get a new one cut. You must order your copy from the manufacturer. And believe me, they cost a lot. Unless you want to pay €200 for a lost key, make sure you remember where you keep it. There’s also an admin fee in addition to the cost of the key. Seatbelts are there for a purpose and they save lives. Children's seats are mandatory in many countries and there’s a fine for not using them as required. The age limits for using child seats vary from country to country so if in doubt check with the hire company. Literally. Different countries have different levels which constitute the legal limit, some less than the UK. So, to be totally safe, don't drink and drive.